The best player of our generation. 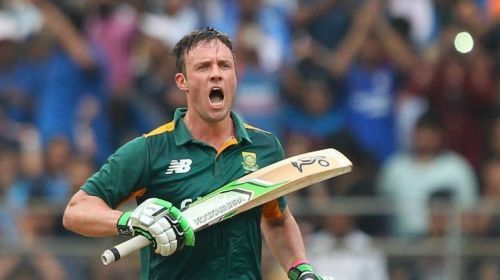 AB de Villiers surprised the entire cricketing fraternity when he announced his immediate retirements from all formats of International Cricket on 23rd May 2018. Inarguably the best batsman of the past decade, his sudden retirement brought an End of an Era in Cricket where not only was he the most dominant batsman, but South African Cricket Team was on the top of the world. 14 years, over 400 international matches, almost 20,000 runs, 47 centuries and millions of memorable moments - This is the best I can summarize an International Career that ended a little too soon. Personally, it is really hard for me to digest the fact that ABD won't be playing for the Proteas again, given that I belong to a generation that grew up watching him play. While his career saw various ups and downs, he always managed to keep a fan following that is second to none. A gentleman of the game, he always believed in entertaining people with his work on the field. As a tribute to the Superman of Cricket, here are five instances that define Abraham Benjamin de Villiers International career. Best Fielder since Jonty Rhodes. When we think of the best fielders of all time, the name Jonty Rhodes instantaneously pops up in our mind. However, just saying that ABD was his apparent heir in this title would be an understatement. While there have been several other players who have made a name with their astonishing catches, ABD was the first person after Rhodes who mastered the art of ground fielding. From his dives on extra cover and point to save a definite boundary, to his exceptional glove work behind the stumps, AB de Villiers was the prototype of a perfect fielder in modern day cricket. Moreover, we are all aware of his abilities to make even the most improbable catches look easy. ABD was called Superman for his profess with a bat, but I think it was phenomenal field work that contributed in earning him that title.